Home > Balance Weights & Balancing Powder > Clip-on balance weights for steel wheels. Storage Bins and panel for all workshops. Durable manufacture in Uk. 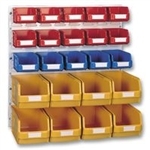 Storage Bins and panel for all workshops. Durable manufacture in Uk.